Author and journalist Ann Hui sampled the food and culture of Canadian-Chinese restaurants across the country, and wrote about what she found in Chop Suey Nation: The Legion Cafe and Other Stories from Canada’s Chinese Restaurants. When Canadians ponder what foods best represent the cuisine of our country, dishes like poutine or maple syrup snow candy often come to mind. But journalist Ann Hui wants to add Canadian-Chinese food — what she calls "chop suey cuisine" — to the list. "Dishes like chop suey, dishes like sweet and sour chicken balls, you would have a very hard time finding these in China," Hui tells The Current's Anna Maria Tremonti. For many decades, Chinese immigrants in Canada were barred by law from many professional jobs, making restaurant work one of the few ways to make a living. But the restaurants also had to attract non-Chinese customers, with a balance of "exotic" and familiar flavours. "They weren't trained cooks, they didn't have access to Chinese ingredients like they would in China, and so they just made this cuisine up," said Hui. "They made up these dishes that were kind of Chinese, that they thought would appeal to Western palates." 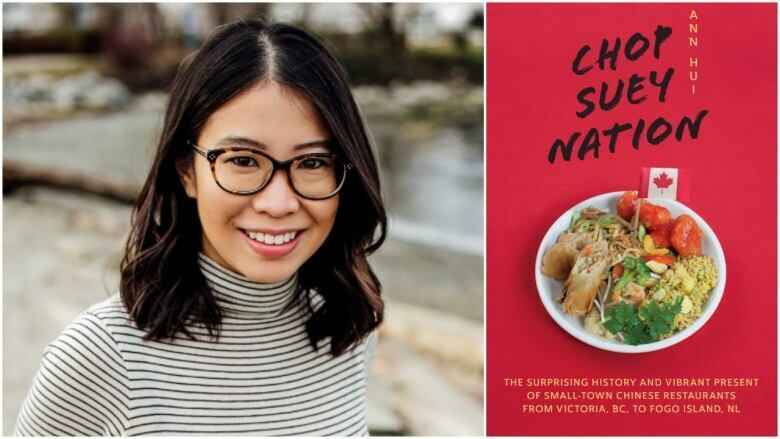 Hui travelled across the country visiting small town Canadian-Chinese restaurants, and detailed what she found in her new book Chop Suey Nation: The Legion Cafe and Other Stories from Canada's Chinese Restaurants. She discovered that not only were a lot of these dishes uniquely Canadian, but different places had specialties that are "ubiquitous within those specific regions, but often only in those regions," Hui said. "In Thunder Bay, if you're a Chinese restaurant, you have to have bon bon ribs. In the prairies, every single Chinese restaurant has ginger beef." Hui sat down with The Current's Anna Maria Tremonti to discuss her chop suey cuisine road trip. Here are some of the dishes she discovered. Chow mein in Newfoundland is made with cabbage instead of the usual egg noodles — even though chow mein "literally means fried noodles," Hui said. "In Newfoundland, because they are an island, it took them even longer than the rest of the country to have access to authentic Chinese ingredients. "And so to substitute for that, the early Chinese cooks in Newfoundland would actually slice cabbage very thinly, so that it resembled — somewhat — noodles." The deep-fried rib dish called bon bons, invented in the 1940s, is a specialty across Thunder Bay's Chinese restaurants. Ling Lee's Chinese Cuisine, in the Port Arthur Curling Club, sells more than 68 kilograms of ribs a week. "The flavour is a little bit salty, so it goes really well with beer, which goes really well with curlers," joked owner Norina Karschti, who took over the restaurant from her father Ling Lee. "You have your egg rolls, your fried rice, chicken balls, and bon bons. Those are like the staples of Thunder Bay cuisine," she told The Current. Customers like Allen Poirier can't get enough. He's been coming to Ling's for 25 years at least, because his wife loves the "crispy as heck" bon bons. "I pity [anyone in] Canada that doesn't have these," Poirier said. 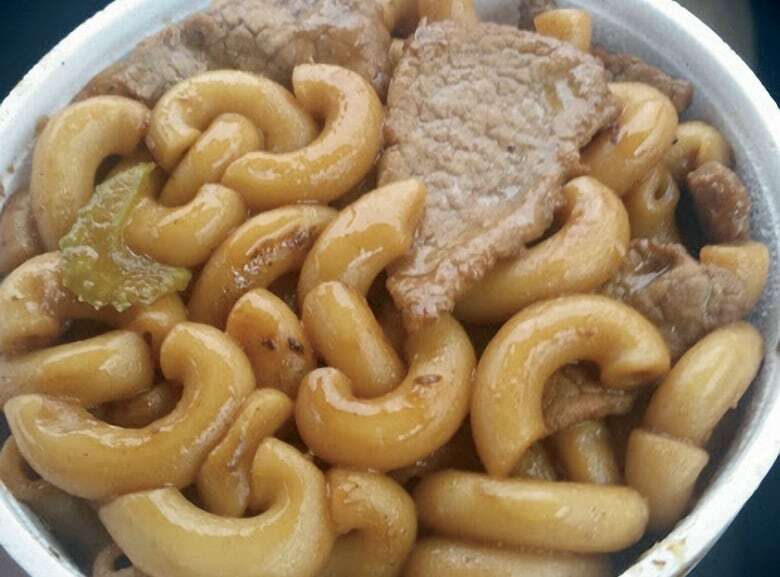 Ginger beef was invented in Calgary in the 1970s and quickly spread throughout the Prairies. 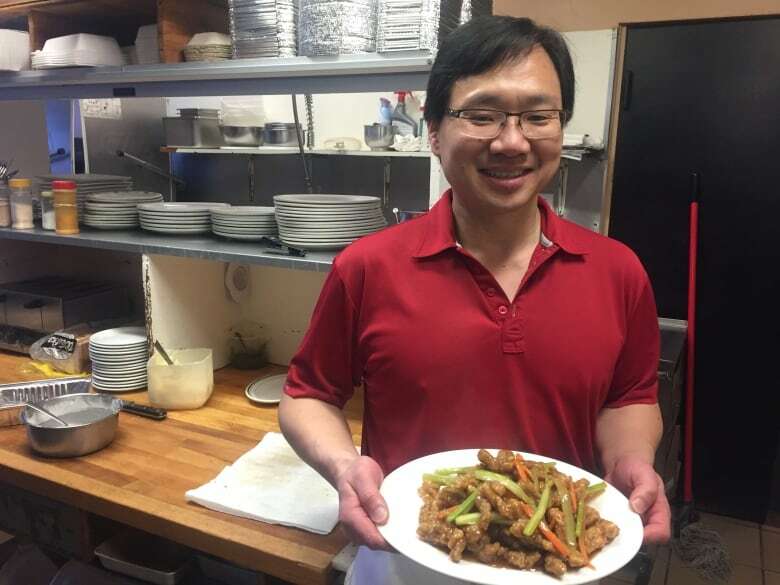 In Bing's #1 Restaurant in Stony Plain, Alta., owner William Choy makes the popular dish with his father Fon. Choy's grandfather Bing Choy started the restaurant in 1970, and many of the customers have been regulars since then. "We had our wedding here with William's grandfather," said Billy Riedlinger. "$2.25 a plate, and a feast that you wouldn't believe." William Choy has a second job too: he's the mayor of Stony Plain. "This community has supported our family lots and it was about time to give back," he told The Current. Fried macaroni is a Quebec specialty, consisting of stir-fried pasta with soy sauce, meat and vegetables. Hui grew up hearing these kinds of dishes denigrated by her family as "fake Chinese," but learned to appreciate them when she found out more about their history. "These dishes have such an incredible history and they tell such an amazing story," she told Tremonti. "It's the story of perseverance, and endurance and sacrifice and entrepreneurialism."